You can see personal branding right there in the title. No, I am not a celebrity. I am just using this post to begin with an apology to my followers/readers. I have been just too busy to write as my social life + my social apps & jobs have swallowed me way more than necessary lately. Now I have added another social network to my list, SNAPCHAT and I really want to tell you about this. More Personal Branding – backed by some numbers. People love numbers…here you go! Currently I am touching 1800 pictures on Instagram, 7000+ check-ins on Foursquare/Swarm, 9500+ tweets, 2000+ on Facebook, 2000 Spotify songs & 10,000 photos taken on my iPhone since Sep’13. I have been a hyper cool kid, hyper connected, distracted, excited and even hyper ignorant to my blog lately. This will change. I will find time & get back on the scene. Now serious stuff starts below…ha! Too strong a start for you? Well let me break it down for you – Facebook was my first social network crush, affair, love and an upcoming divorce. Facebook have come a long way and we have a lot to thank them for rather than point fingers at them but lately they have been on a spree of buying smaller networks to have control. Which is fine but then just because the number of audience on a new network is less, compared to Facebook, then it doesn’t mean that it is fail or has not taken off etc. Facebook has been around for way too long & is a giant roping in many services. Those looking for something that is not owned by Facebook – please welcome Snapchat! Snapchat is a bit of a breather. It does not leave you anything to look back to. It destroys the message as soon it is viewed and sent and another option is to have the message live up to 24 hours and then it is destroyed. It is a kind of social network that celebrates our short attention spans and impatient selves, thanks to technology. Some of you now must be wondering…What is Snapchat and why am I still reading this? I am too lazy to download and check it out…but let’s see if this article saves some effort. It will. So before you close this window read on. And yes there are ‘filters’…I know you are suddenly interested now. Once you download and register – open the camera. Top left is to control the flash on/off and top right is to select front/back facing camera. With one click you can take a picture and if you keep it pressed, you start taking a video. For images you can select for how many seconds should the image appear for your friends to see, max 10 seconds. (Short attention spans – an insight – you see!). The arrow down button is to ‘Save’ the image to your camera gallery. The boxy+ button is to add it as a story. To add text, simply click on the image once you have captured it and start typing. You can also select the doodling tool & doodle. Scroll through the color palette to select your choice of color. Once you have captured your Snap, slide to the right and it’ll give you basic filters and there’s even a black & white. Grubhub shared a story on Snapchat a few hours ago today. Those who see this post today, probably have a chance to experience it first hand today if you are able to still find it online. I took screenshots, because it is a very good example to show Snapchat users how they can get involved. It’s National Hot Dog day – so Grubhub decided to have some fun on Snapchat & engage the audience who will otherwise Snapchat Hot Dogs anyways today. If you see these screenshots, which I have placed in the order as it appears, you’ll notice how within just 60 seconds, Grubhub has rolled out a call-to-action for their followers and even shown ‘HOW’ it has to be done on Snapchat. This is a pretty neat example showing how brands can use Snapchat and involve people who are still trying to figure out how Snapchat works. There is a comfort level for the users and they address that some users still struggle to use Snapchat because a majority of us are so used to clear labels across the Internet. It is a good idea to walk the followers through and grow with them. Earn that comfort level side by side on a tool that many people I know just shun it because they don’t get how it works. This is certainly not a flaw; it is the future of tech. Minimal design is the future and with wearables tech coming up in other news, icons & advanced technology, with even lesser and automated steps, will become more widespread. We have to adapt. I hope these screenshots and an example of story help further to understand the user and marketer way of using Snapchat. I know you must be thinking now…where did the Cool Kids part go. It is here. Why is Casey Neistat a cool kid on Snapchat? Because he gets it & he is not afraid to try. No he did not pay me to write this and does not even know me. But may be he will know me now. I still don’t want to get paid for this advertising. I am a TRUE FAN! Casey is one of the coolest filmmakers around and has embraced YouTube when it was taking off in all sorts of short-film making world online. He is well aware that Snapchat stories means videos too & bam, he picked it up just like we all should. Casey is making an effort to take out time & share interesting experiences on Snapchat. It’s like you can see what he is doing when he is not filming, how he prepares for films, some personal experiences that can be shared with public, cool restaurant reviews and for this non-stop entertainment he has even backed up the batteries. Disclaimer: Snapchat addiction can drain batteries. And if your personal stats are like mine on social networks, then get ready to charge your phone for an extra round during the day. We need cool kids like Casey to ‘assure’ the talent in our industry like celebrity endorsements, marketers, brand managers, interns, creative directors, account managers, clients, clients who don’t get social media, clients who want to be cool, clients who want to be clients, …’assure’ that it is OKAY to NOT BE PERFECT at all times & real-time is so much more fun and authentic than locking up copywriters in booths and making them go through 5 rounds of changes, just because people want to contribute more in terms of competition of giving feedback, rather than adding value & understanding what ‘social media’ actually means and make it so perfect that it is so numb and dumb and superficial, that it doesn’t really do its job. Opinion. A very strong opinion. I still believe that 70% of our digital industry still does not understand that social media can be so simple & the beauty of it is that it does not need to be superficially perfect. It is one of the rare areas where we are allowed to talk freely and let go sometimes, to keep it real and original. I think you need to watch some of Casey’s videos to see just how cool it is to capture some moments in a natural way & this is the real storytelling, than micro managing every single dialogue that is shared by a brand and make it look like the most dry-cleaned and social proof message in the history of social media. So Audi is young and plays it safe when it comes to their brand. But on Snapchat, they are wayyyy off brand and have a refreshing unexpected side of sharing social content. Their recent partnership with ‘Pretty Little Liars’ is surprising & Audi is posting funny Snapchats with hints on the next season, in creative executions, that are not Audi like. ‘Emojis’ are the new copy here as clues to what will happen in the next episode. Emotional because I am disappointed that brands are so slow on taking up Snapchat & I am in meetings discussing Facebook fan growth and reach at least 4 hours every week. Can you creative directors please wake up the industry, learn and embrace such networks and follow a new way to express ‘brand’ content. Make it more fun, more reachable, more connected & more comfortable to consume. Desktop is so irritating! I am not saying throw your brand guidelines out of the window. Use this platform to add an element of surprise & an opportunity to get noticed. Don’t be afraid to break through the clutter. 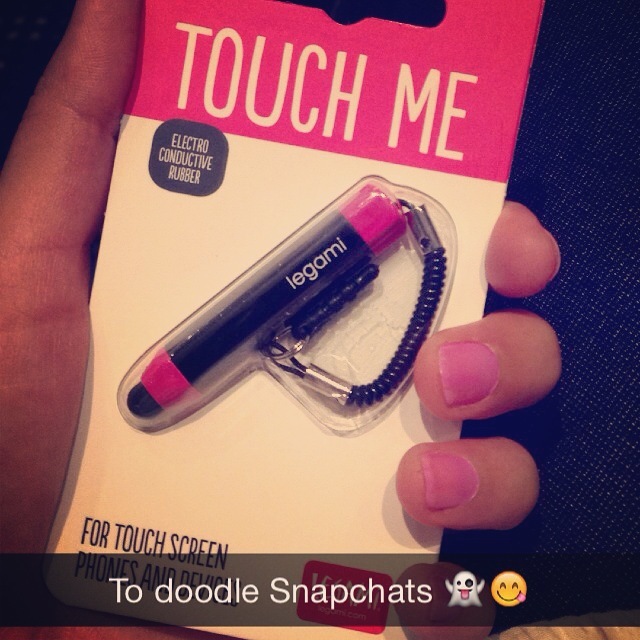 Buy one of these for a very ‘fine’ DOODLING experience on Snapchat. Enjoy! A beautiful film by Nike featuring Casey Neistat. Apparently Nike asked him to do a movie for Fuel Band and he spent all the money travelling around the world for 10 days – America, Europe, Asia & Africa – and returned with an adverfilm for Nike on the message of #makeitcount. The video has some great quotations and shares the energy that the Nike brand surrounds itself with! A great film in general and not even a mention about the products…well they are trying to make life count in this one I guess wearing a Nike Fuel Band.